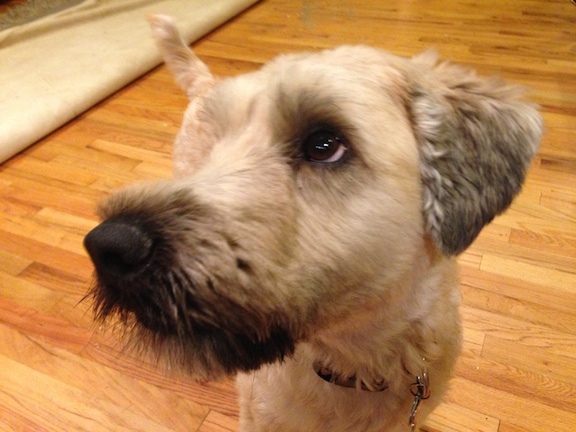 Neely is a three-year-old Wheaton Terrier who has become territorially aggressive after being pepper sprayed by the mail man. Prior to the mailman’s use of the pepper spray, Neely was a happy dog who loved everyone. His owners were hoping I could help Neeley return to being a happy friendly dog. I took care to use a soft, non-confrontational body language as I walked up the driveway as I could see Neely standing on the couch so he could look out the large window that overlooked the family’s front yard. Dogs make first impressions just like humans do and I wanted to make sure we got off on the right foot. Fortunately Neely was welcoming to my presence so after letting him give me a respectful sniff, I sat down with his family to discuss how I could help. In the course of our discussion I learned that Neely didn’t have many rules or structure in place to help him know what limits and boundaries his family wanted him to respect. Because Neely had taken to sitting on the top of the back of the couch so he could look out the window, I suggested that they make all furniture off limits. I made this suggestion for two reasons; first off, dogs equate status and authority by the height at which they sit in conjunction with their peers. By letting him sit at the same height (and sometimes a higher level) than the members of his family, Neely perceived himself on equal footing as the humans in the home. Keeping the dog off the furniture will help Neely see a distinction between himself and his owners. The second reason I suggested no furniture was to limit Neely’s exposure to things that may trigger outbursts of territorial aggression. If he wasn’t allowed on the couch, he wouldn’t be able to see people he considered threats or trespassers. Although I had separate reasons for no furniture, the combination of the height at which he sat along with access to see trespassers undoubtably increased the intensity of the behavior. Dogs with aggression generally get more intense the more practice they have so keeping the dog from exposure to these “triggers” is an important aspect of the rehabilitation process. In this case, Neely’s aggression came out of a negative experience that was fear based; not wanting to be pepper sprayed again. Due to the mailman’s actions, Neely now associated strangers or visitors as violators and he lashed out with his aggression in an attempt to protect himself and fend off the trespasser. My goal was to use counter conditioning to change Neely’s perception of the mail man from threat to something good. Before I go through the process here, I want to mention that this is a very condensed summary of counter conditioning. If your dog has any fear based aggression, counter-conditioning is a great way to rehabilitate the dog but needs to be done correctly to work. If you fear your dog may bite or attack the object of its fear, please contact a behaviorist like myself for help rather than attempting this procedure on your own. In this case, the mail man was not going to be helpful or cooperative as he has a reputation for unnecessarily pepper spraying dogs. While this can temporarily stop a dog, the behavioral effects are much longer lasting. As a result this mail carrier is actually making the neighborhood he delivers to more dangerous to other delivery drivers as the dog’s experience is mailman or delivery driver arrives, dog gets a face full of pepper spray. In that scenario, being fearful or angry at the sprayer is both natural and unnecessary. After his experience with the mail man, Neely had started to take a dislike to some of the children who were friends of the family’s preteen children. This is usually a result of the child exhibiting some similarity to the person or action that was the original trigger. Sometimes this can be a hat, uniform, sunglasses, beard, etc. The dog identifies a physical or other characteristic (such as walking on the same path as the mail man, etc) and associates all who have the same trait as being in the same group. Neely’s owners told me that the his absolute favorite thing was treats, especially any with meat in them. For some dogs, the high value item may be a ball to fetch or a favorite toy. The important thing is to identify the highest value item to your dog. They arranged for one of the boys that Neely was reactive to, to help us. I had the boy meet me across the street in the neighbors lawn. We were about 100 yards from Neely’s front door. I instructed the boy to walk forward two steps at a time and only after I gave the signal. I went back inside Neely’s home and locked the front glass door to ensure that Neely couldn’t get access to the boy, then I signaled him to start walking directly towards the front door to Neely’s home, two steps at a time. At first Neely showed almost no interest. He saw the boy, but did not react and that is exactly what I wanted. Because Neely barely noticed the boy, I kept giving the signal right after each set of steps. Once the boy had crossed the street and was on Neely’s front yard, his attention to the boy became more pronounced. He wasn’t barking or lunging, but he was focused on the boy. At this point I dropped a meat treat down right inside the glass door. Neely immediately bent his head down and gobbled up the treat. I waved the boy to take two more steps and once he moved closer, Neely started to focus again so I dropped another treat. We continued this process until the boy was only a few feet away from the door to the home. As Neely became more focused and his body got stiffer, I increased the dropping of the treats. His owner told me that Neely was never this quiet and calm when the boy was this close. This was likely due to the high value treats and partially due to the boy stopping after every two steps. Once the boy stepped onto the front porch, Neely jumped up and pounded not he door with his front paws and barked. I had told the boy when I gave another signal that he was to immediately turn and walk away. As soon as the boy turned, I stopped dropping the treats. Its crucially important to stop the exercise at the first aggressive reaction from the dog. The next day, the trigger can usually get a little closer before the dog reacts. You want to gradually get the trigger closer to the dog each repetition. This needs to be done on a pace the dog is able to absorb. If you keep pushing after the dog gets excited or aggression you are only intensifying the dog’s reaction which is why its so important to take your cue form the dog and stop when the situation is more than your dog can handle. The idea is for the dog to associate getting these really desirable treats as the boy approached. As soon as the boy stopped coming towards the dog, the treats stop. After repeating this exercise, the dog starts to associate the goodness of getting the treats with the boy approaching. With practice and repetition, the dog will soon look forward to the boy coming over as he is rewarded each time. Each dog’s rehabilitation length is different depending not he dog’s personality, energy level and the intensity of his reaction to the trigger. Some can learn to stop being aggressive after a handful of repetitions where others may need weeks, months or longer. Based on Neely’s progress in only one session, I would guess that he will only need a few days or weeks to get over his fear. The more often his owners practice this exercise, the faster he will learn to stop being fearful and reactive to the trigger.